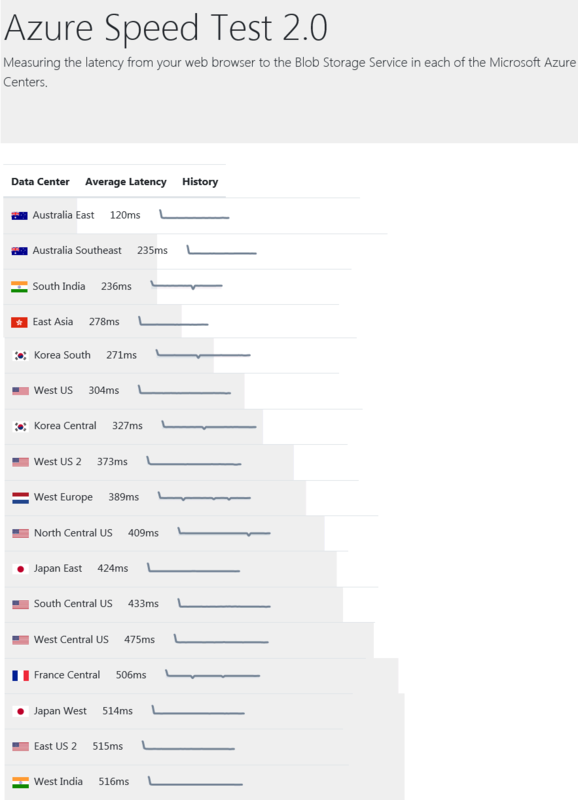 Azure currently offers data centers in 54 regions worldwide and in 140 countries. To get a little background about the effort being made for a performant worldwide network, check out this article at "How Microsoft builds its fast and reliable global network" with an overview of their dark fiber network and their software-defined networking (SDN) strategies. "Microsoft owns and runs one of the largest backbone networks in the world,connecting our datacenters and customers. Over the last three years, we’ve grown our long-haul WAN capacity by 700 percent." Microsoft owns and runs one of the largest WAN backbones in the world. To run a global private network, Microsoft stays in control of capacity and resiliency to guarantee that the network can survive multiple failures. 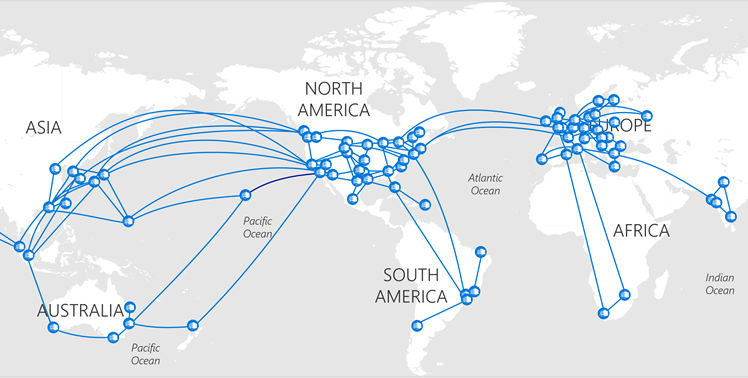 All Microsoft data centers are connected within that network. So, how can you test your connectivity to the Microsoft data centers? 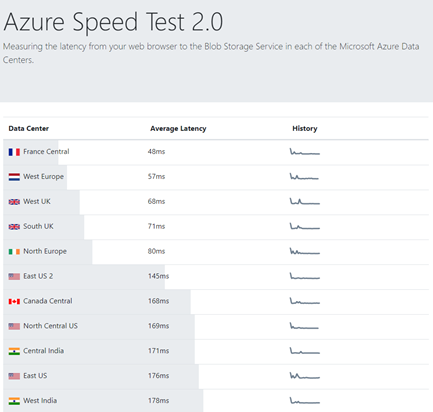 Well, the website azurespeedtest.azurewebsites.net allows to measuring the latency from your web browser to the Blob Storage Service in each of the Microsoft Azure Data Centers (I wrote about that topic some time ago here). So I tested today with the following results. For my location in Vienna, Austria, I currently see that France Central, West Europe, UK and North Europe are good locations for my Europe-based services. Then, I flew quickly to Australia and checked it there to compare (I did provision an Azure VM in Down Under, in Australia East). 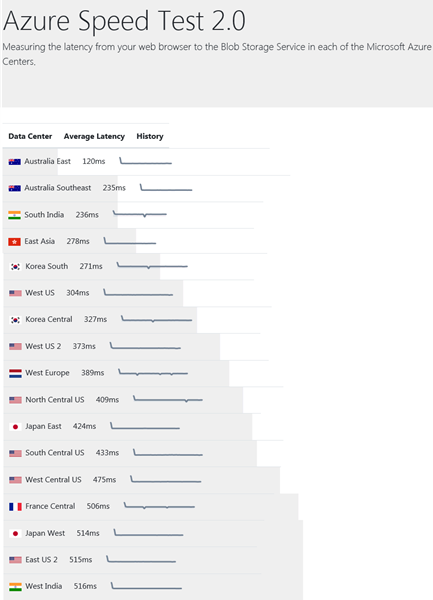 Unsurprisingly, there the best data center locations are in Australia itself, followed by South India, East Asia, Korea and the US West coast. 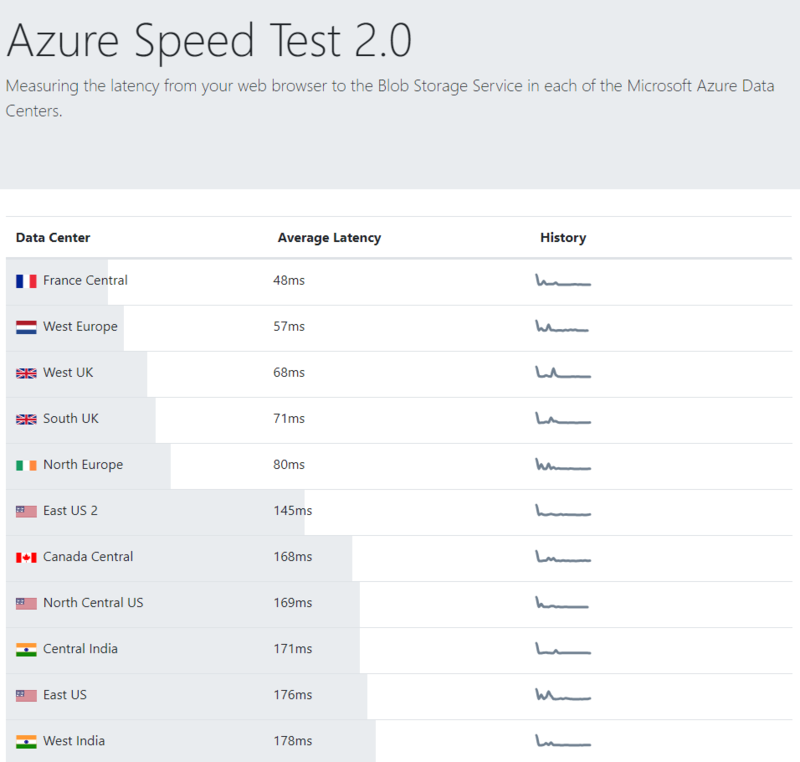 Another more extensive tool is available at www.azurespeed.com. There are multiple tests for selectable regions available. From Australia, the result looks similar as above, Australia leads before India, Asia Pacific, Korea and the US with temporary fluctuations. Of course there are many more options to speed up apps as Azure Frontdoor, App Proxy, Traffic Manager, Scale out, Express Route, etc. but for new projects, I recommend first to check the network latency. Then decide what regions and services make sense for a good performance. I hope this quick info helps for a quick personal network test against the Microsoft Azure cloud.